The Fall of the Berlin Wall in 1989 did not take believers in the Eastern Block by surprise. They had been fervently praying for God to intervene and He did. Perhaps the greatest miracle of the 20th century was Communism falling on its own. If suffering with the Regime had been an eschatological expectation, the fall of the Regime was an eschatological celebration. And through all these times, the search for deep, biblical holiness after the heart of God never stopped. For the people of God, that search was always miraculous and prophetic. I n the spring of 1989, a Danish journalist by the name of Johny Noer came to Bulgaria with a prophetic message. For years he had lived and travelled in many countries with his family and coworkers in a convoy of several trailers. They met the start of 1989 with a seven-day fast on the island of Pathmos where God told them to travel to Eastern Europe and proclaim the fall of the Regime. The Convoy did so through many difficulties paying a high price to minster in Bulgaria for the next three months. The last service they conducted before being extradited by the authorities was on Easter morning at the Black Sea port city of Varna. Thousands of believers arrived from all over the country. 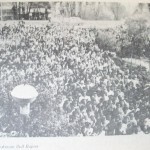 The use of an auditorium was not allowed so they gathered outside the small Pentecostal church at the cities outskirts. They were surrounded by a dense police cordon of several hundred K9 patrols. Under these circumstances, the sermon could only be short and simple. In fact, it contained the exact words the Communist Police forbade Pastor Noer to say: “Let My People Go!” A prophecy was given that Communism will soon fall. It was fulfilled exactly seven months later on November 10, 1989. But there was something else that happened at that memorable Easter morning. Two large scrolls were brought into the church. There, over 5,000 men and women signed their names as a testimony of their dedication to God and preaching the Gospel until revival breaks through in Bulgaria. Beside a petition to the government for religious freedom, this national declaration affirmed the search for holiness, which even Communism had not been able to stop in Bulgaria. In the fall of 2014 our ministry invited Pastor Johny Noer to Bulgaria again. His second visit marked exactly 25 years since the Fall of the Berlin Wall. After a week long crusade in a dozen of Bulgarian cities, several thousand Christians gathered again in Varna and signed two new scrolls containing the Second Varna Declaration. The event was just like a quarter of a century ago and made clear that revival cycles take place on increments of 25 years – a period where two generations overlap. It also proved that the search for holiness has not stopped in Bulgaria.